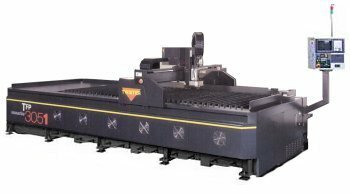 Twister TFP3051 - G & W Machinery Sales, Inc. The Twister TFP3051 featuring a 5 ft. x 10 ft. cutting area and 30 kW (150 Amp) Fine Plasma torch is available NOW! The TFP3051 has a maximum working height of 5 in. (125 mm). The Twister TFP3051 with High Body Factory Installed Option extends the maximum working height to 11.8 in. (300 mm). If you need larger table sizes or more power, check out the Twister TFPL Series featuring table widths of 8 or 10 feet, in 20 or 40 foot lengths, with either the 30 kW or 60 kW (300 Amp) Fine Plasma torch. Technology in the TFP3051 and TFPL Series is protected by US Patents, and other Patents Pending.